Except perhaps on Halloween, most of us don't like to see faces hidden by hoods, which suggest mystery and sometimes menace. So you may well imagine that even a patient suffering from Ebola might feel alienated by the sight of a health care worker totally enveloped in a protective suit--no matter how much help that worker might have to offer. Last August, Dr. Senega Omeonga, head of Infection Prevention Control at St. Joseph's Catholic Hospital in Monrovia, Liberia, came down with Ebola himself. Though he survived it with the aid of ZMapp, the experimental anti-Ebola drug, one of the things that made him feel as if he were "living in hell," he said afterwards, is that he could neither touch nor "see the face" of the person treating him. (NPR Interview, December 25, 2014). This problem has now been solved by the kind of project that seems obvious only after someone has thought of it: humanizing health care workers by means of a wearable portrait--a headshot printed on a disposable adhesive label attached to the upper chest area of the worker's outer gear. With a name above the photo, as shown above, the once-hidden worker is instantly revealed. This portrait project is the brainchild of Mary Beth Heffernan (full disclosure: she was once married to a nephew of mine), an artist who teaches sculpture, photography, and interdisciplinary art at Occidental College in Los Angeles. For the past dozen years, Ms. Heffernan has been exploring in her work the relation between the human body and the words and images used to represent it. For Soldiers' Skin, for instance, a project exhibited at the Pasadena City College Art Gallery in October 2007, she took her camera to tattoo parlors near a Marine Corps base in southeast California and photographed memorial tattoos: pictures of dog tags, helmets, rifles, and boots signifying lost marines and freshly needled into the chests, backs, and arms of soldiers who had fought with them in Iraq and who--in many cases--were about to return to the war there. For the war against Ebola she conceived a different project: revealing the faces of those who must be totally covered even as they face one of the deadliest diseases of our time. This past January, after months of networking with NGOs and interviewing doctors working in Liberia, she was invited to the country by Dr. Moses Massaquoi, Liberian Chair of Ebola Case Management, who is also Country Director for the Clinton Health Access Initiative. Dr. Massaquoi asked her to bring her portrait project to the Ebola treatment units (ETUs) of both rural and urban Liberia. She did so with the aid of grants from Occidental College and the Arnold P. Gold Foundation. Along with Marc Campos, the Occidental College photographer who documented her project, Ms. Heffenan has just spent three weeks in Liberia with two ETUs and one ambulance team. "Clinically," she reports (in an email of March 25), "the labels are a huge success," and this verdict has just been seconded by Joy Hardt, Chief Nursing Officer at the ETU in Tubmanburg, Bomi County, where Ms. Heffernan spent part of her time. As soon as Ms. Heffernan arrived at this unit, she took headshots of Ms. Hardt and two other officers. She also trained Ms. Hardt and one other officer so that they could carry on the project by taking headshots of all staff members who frequently see patients and by printing labels with the equipment that Ms. Heffernan left them: camera, printer, labels, and inks. Since March 12, Ms. Hardt reports (in a March 26 email to Ms. Heffernan), all of the staff have been wearing the photos, and she expects that the supplies left by Ms. Heffernan should last until the unit closes. Everyone at the unit likes the photos. One patient said, "I like that I can see who is taking care of me," and a doctor said that the photos make him "feel more like I am working with people . . . instead of inanimate objects." The workers at this unit can now identify each other with ease. Besides visiting Tubmanburg, Ms. Heffernan spent most of her time at the ETU unit run by the Liberian Ministry of Health in Monrovia, the nation's capital. There she also took headshots of the staff, printed labels, trained a Hygienist supervisor named Ben Smith to carry on the project, and left all the equipment he needed to do so. As a project conceived by an artist, wherein lies the art? In its transformation of the relation between the healthcare worker and the patient. 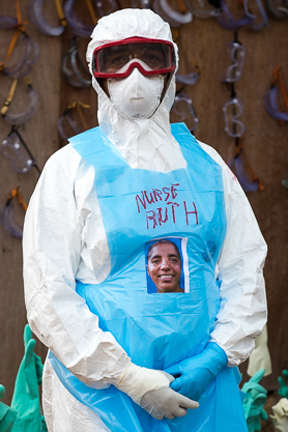 As Ms. Heffernan has learned from doctors such as Soka J. Moses, former Clinical Director of one of the largest Ebola treatment centers in Liberia, the protective suits worn by health care workers intensify the isolating effect of the disease and thus threaten patients' sense of their humanity--their individual selves. Patients "die from Ebola," writes Ms.Heffernan, "but they also die from humanity's withdrawal from them." (email of March 27). Dr. Moses actually told her that if the portrait project had been implemented earlier, it "would have saved lives." W.H. Auden once wrote that "poetry makes nothing happen." But once in a while, art does.